Superior quality grade 304 stainless steel outdoor decking or in-ground light, with a single high power 1w white LED light. 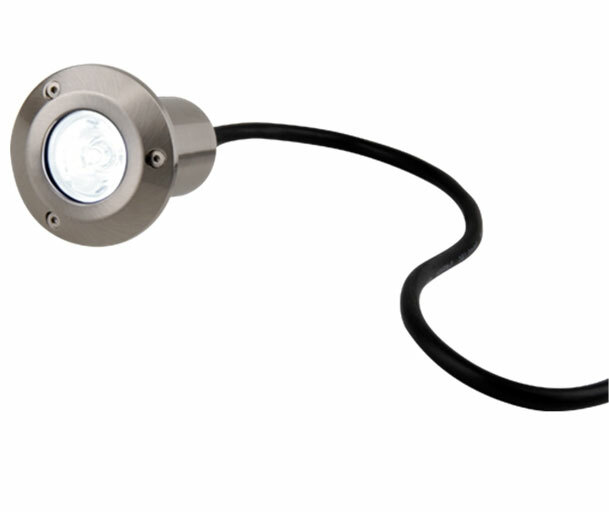 Rated IP67 and with a maximum load of 500kg, this LED ground light is perfect for use in decking, paths and patios. Supplied with 1m of 3-core .75mm flex for easy installation to a junction box and a ground sleeve that must be used for in-ground installations. The ground sleeve is not required when fitted into an outdoor deck. Sleeve diameter 90mm – depth 90mm. Cut-out with sleeve 60mm – without sleeve 39mm – suitable for indoor and outdoor lighting use.